On April 30, thousands will climb Edinburgh's Calton Hill to participate in a sort of entertainment free-for-all of Gaelic culture while in the South Downs National Park they'll feast, dance and burn a wicker man on the same night. It all spills over to May 1 with a Beltane festival at Thornborough Henge in North Yorkshire and celebrations of the lusty month of May all over the country. And don't worry if you can't make it to the UK in time for the April/May party. In the Scottish Borders town of Peebles, they do it all over again in June. Lammas or Lughnasadh, once marked in Ireland and Scotland on August 1, was a celebration of the first wheat harvest (Lammas - loaf mass) and is still a time for early harvest festivals, here and there around the UK. Samhain, pronounced sow-in was the end of the harvest and the beginning of the dark days of winter on November 1. It survives as All Hallows - the night before is Halloween. Imbolc, pronounced imolg, celebrated the start of spring and the lengthening of days. In Ireland and parts of Scotland, it is marked as St. Brigid's Day. Beltane celebrates the start of summer, symbolically welcomed by the Queen of the May, a kind of fertility figure. The Green Man, an anarchic male fertility figure, sometimes takes part and in some versions of this festival a wicker man, symbolizing the old season passing, is burned. In ancient times, livestock may have been offered for sacrifice (handily then being cooked for the feast) inside the wicker man. Of the four festivals or "Quarter Days", only Beltane has resisted redefinition as a Christian festival and retained its echoes of pagan fertility rites. Because of that, it faded in the Victorian era and by the beginning of the 20th century was all but forgotten. The only sign of it was in the more innocent festivities of May Day - though, considering it's pagan origins, how innocent was the subtext of all those innocent young girls dancing around the Maypole? With the revival of New-Agey paganism and Wiccan plus a renewed interest Celtic and Gaelic traditions. Beltane has been cropping up here and there on the British festival calendar. These days it's more of a cultural celebration featuring, music, performance, food, and drink though it can also be an occasion to learn about older British customs such hand-fasting. The terms Gaelic and Celtic are often used interchangeably or confused when talking about Welsh, Irish, Scottish and ancient English traditions. Actually the term Celtic refers to the ethic tribal groups that spread across parts of Europe and settled in the British Isles. it's also used to describe their ethic traditions. Gaelic is correctly used to describe their languages. Since 1988, The Beltane Fire Society, a registered charity, has been hosting a modern revival of Beltane on Calton Hill, overlooking Edinburgh and the Firth of Forth. What began as a small gathering of enthusiasts has now grown to a participation event with hundreds of performers and thousands of revelers. Described by the organizers as "the only festival of its kind in the world," it is a spectacle of death, rebirth and the "eternal battle of the seasons." What makes this performance event unique is that the story unfolds all over the hill, with no barriers between audience and performers. Celtic characters and fire dancers spread all over the public parkland. This is a ticketed event with entrance to Calton Hill from Edinburgh's Waterloo Place. Events kick off at 8 p.m. on April 30 every year and last to about 1 am. Tickets are available online from Citizen Ticket for £11 or on the gate for £15 if any are available. It's actually a good idea to book in advance because this is a popular event and once the grounds are full the gates are closed. Butser Ancient Farm is an unusual archaeological site that functions as both a working farm and an open-air research lab where the working methods and lifestyles of Neolithic Britons are explored. Located near Waterlooville, Hampshire, the farm is in the heart of the South Downs National Park. 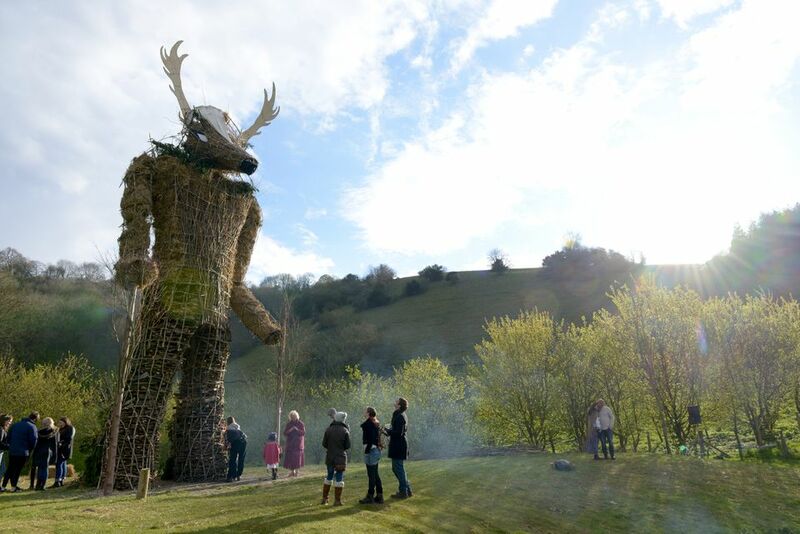 They celebrate the start of summer by setting fire to a 30ft-high Wicker Man at the culmination of their festival. Their Beltain celebration (note the slightly different spelling) includes crafts, hot food, live bands and drumming, dancers, storytellers, face painting (with woad), birds of prey demonstrations, Roman cooking, traditional skills demonstrations, Morris men and more. The celebration, from 4:30 pm to 10 pm (on Saturday, May 4 in 2019) is ticketed, with early bird tickets, costing £20 for adults available online until April 1. After that the price increases to £28. The farm is off the A3 between London and Portsmouth, about 5 miles south of Petersfield and signposted from the Chalton/Clanfield exit. No cars are allowed on the site but parking is on a hill above the farm - about a 15 minute downhill walk (remember, it is also an uphill walk in the dark at the end of the event - so bring a flashlight). The Thornborough Henges is an ancient monument and ritual landscape made up of three giant circular earthworks. It was created by one of the earliest Neolithic farming communities, about 5,000 years ago, but its purpose is unknown. It's located in the North Yorkshire Ridings, north of Ripon. Since about 2004, a group of local pagan enthusiasts has been sponsoring a Beltane festival with camping here. The henges are a protected landscape being mapped and studied so this is the only time of the year when it is open to the public. The event is dedicated to the goddess Brigantia who was worshipped by a local ancient Celtic tribe known as the Brigantes. The crowd is a mixture of committed pagans, dressing up and re-enacting enthusiasts and people who just like to have a good time at a camping festival. The vibe is distinctly New Age. Camping, costing £3 per person per night in 2019, must be booked in advance but day entry is free. Payment is via Paypal to guardiancelebrations@outlook.com, indicating how many people and which nights. The Beltane ceremony starts at noon, Sunday, May 5, Bank Holiday weekend. The site is remote and can't be reached by public transportation. Check here for directions. The Scottish Borders town of Peebles has been holding a Beltane Fair since at least 1621 when it was granted a charter by King James VI of Scotland (who was also James I of England). Even earlier reports exist of King James I of Scotland witnessing the festival in the 1400s. Traditionally, the fair coincided with May Day on May 1, but in 1897, the year of Queen Victoria's Diamond Jubilee, it was combined with another traditional festival - The Common Ridings - and moved to June. Peebles has celebrated the event in June, around midsummer, ever since. In 2019, Peebles Beltane Week takes place June 16 to 22, with the Beltane Festival itself on Saturday, June 23. Events during the week include local dances, a concert, riding the border marches, and a fancy dress parade. On the Saturday, the Beltane Queen is crowned. This is mostly a daytime affair with a parade of the Queen with her fairy court and plenty of marching bands and pipers.